Cooler Master’s no stranger to peripherals; when mechanical switches became the hottest thing overnight, it wasted no time getting into the lab to make sure it created products people yearned for. The company’s just-released NovaTouch TKL highlights that goal, with its “Hybrid Capacitive” switch – one that really, really surprised us. Here at Techgage, we have reviewed many different keyboards and keyboard types – from mechanical to membrane to scissor. Rule of thumb: mechanical are the most popular for gamers and enthusiasts, and up to this point, CHERRY MX has been the go-to switch type. CHERRY MX offers a variety of flavors of its mechanical switches, designated by color. The differences between some of them are subtle – whereas some of them are not so. They vary in feel and audible feedback – how hard or how gently you have to depress the switch. Today we are going to be looking at something different. 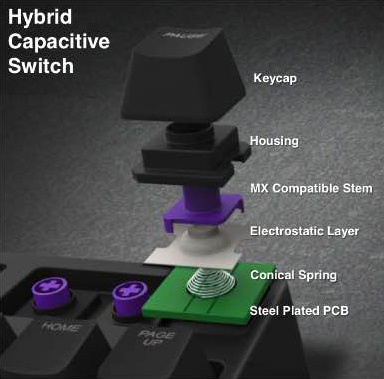 Cooler Master’s NovaTouch TKL is using some new switches dubbed “Hybrid Capacitive”. How do these work, and how are they different from other switches? These are good questions, so let’s figure out the answers. Mechanical switches, in a nutshell, are exactly what they sound like. There is a set of contacts inside of every single switch that must make contact every time you press the key. The different flavors of switches all give you different tactile feedback, audible feedback, and key travel for switch actuation. As well as these switches are made, they still rely on old-fashioned contacts. What makes the Hybrid Capacitive switches different? The hybrid portion of the switch is the spring inside that gives resistance to travel and bounce back. There is no need for actual contact between surfaces as it’s capacitive. In the dome, there is a dielectric material, and in the PCB, there is another. When the key presses, there is an increase in capacitance, and sensors will trigger when it reaches a certain threshold. Take for example a lot of Android smart phones out there – instead of clicky-style buttons, they have capacitive screens that only work when you touch it with a glove-less hand. This is the same concept with the Hybrid Capacitive switches here – instead of using human skin as the dielectric, it uses an electrostatic layer between the button and steel plated PCB (printed circuit board). This technology is what gives the keys that linear feel in both directions – there is no tactile coupling like with a mechanical switch, and no “mushy” feeling that you get with a silicone membrane style keyboard. The silicone membrane is what is responsible for typing fatigue – the extra effort needed to actuate the keys. However, a few people may find this type of key strangely familiar, and rightly so. With some rather odd marketing choices in its wording, what Cooler Master has picked is something called a Topre Key. More surprising is that these keys are not new, far from it. The patent application was first put through in 1984, and was later accepted in 1986. Just as the resurgence of CHERRY MX keys took keyboards by storm, they too were not new, it’s just that there is now a market for them. What is new, and what Cooler Master has done, is hinted at in the picture above: It’s standardized the key cap, which is explained a little later. The first thing you will notice about the way this keyboard looks is that it’s simple. There are no frills of any kind as far as eye-candy goes. No backlighting, no colors, no macro keys, no 10 keys either. Plain, simple, and clean-looking – a “sleeper” if you will. The first thing I did after looking this keyboard over was to wrap my big gorilla paws around it to see how much flex the keyboard has when twisting it from corner to corner. The deflection was more or less unperceivable – almost like I was trying to flex a solid piece of Adamantium; no creaking noise at all, either. Something else that caught my attention was the weight of this thing – for being as bare-bones as it is, this keyboard is stout! One feature of this keyboard is a detachable cable. Personally, I have never seen the point in having something like this. I have been on computers since 1988, and I have never found myself thinking “I wish this cable were detachable”. Having said that, it is not a bad thing by any means – it is just not something that impresses me. The detachable cable ends are gold-plated and the micro USB end is right-angled. The bottom of the keyboard is what you would expect from any keyboard out there – non-slip feet on all four corners for if you choose to lay the keyboard flat; and pop up feet, also fitted with non-slip pads. As I mentioned earlier, CHERRY MX switches are very common amongst enthusiast and gamer keyboards, thus replacement caps for keyboards that fit the CHERRY MXs are the most plentiful – that is not an issue here. Cooler Master put some thought into its design of the NovaTouch TKL, as it’s the first Topre Key based keyboard (that I’m aware of) that’s compatible with CHERRY MX key caps – that is a big win in my book. Also included with the keyboard is a tool to remove the keycaps and rubber o-rings. These rubber o-rings can be fitted to the caps, reducing the amount of travel that they keys will move, as well as reducing the ‘thud’ when you bottom out (fully depress the key). This modification is popular among many mechanical keyboards as it reduces travel, and switch noise. Personally, I found these truly unnecessary for my personal use. This keyboard feels so nice to type on straight out-of-the-box, I can’t imagine changing the way it feels or sounds in any way. This keyboard does include multimedia controls, however they are all located on the “F” keys. To use these controls, you have to use the “Fn” key first. This is not something that I personally like from a keyboard, but this being a basic 10-keyless keyboard, it is just the nature of the animal.